According to the survey results, more than one in four Latinos (27 percent) lack a regular health care provider. * Latinos are a diverse population, and a variety of factors need to be considered to understand why some have regular providers and some don’t. Immigration and assimilation are factors, as large shares of Latinos born outside of the United States and those who speak little English lack regular health care. Socioeconomic factors, such as education, immigration and language, weigh heavily in creating these disparities. However, there is also a substantial share of U.S.-born, fully assimilated Latinos in the ranks of those with no usual health care provider. Hispanics who are most likely to lack a usual place for health care include men (36 percent), the young (37 percent of those ages 18–29), and the less educated (32 percent of those lacking a high school diploma). Generally, Latinos who are less assimilated into U.S. life are also at a disadvantage: 30 percent of those born outside of the 50 states, 32 percent of Spanish speakers and 43 percent of immigrants who are neither citizens nor legal permanent residents lack a regular health care provider. The uninsured are more than twice as likely (42 percent) as the insured (19 percent) to lack a usual provider. Although lacking health insurance raises the likelihood of not having a usual health care provider, having health insurance in no way guarantees it. Of those without a usual source of health care, 45 percent have health insurance. Finally, even though the poorly educated and less assimilated are less likely to have a regular health care provider, they comprise only a portion of the population that falls into this category. A sizeable proportion of those with no usual place for health care have at least a high school diploma (50 percent), are native born (30 percent), are proficient in English (52 percent) or are U.S. citizens (50 percent). Access to health care can be defined in any number of ways, but one widely used approach is to consider whether a person reports having a usual place to seek health care and advice. As is common practice,13 we consider any respondents who report having a place, other than an emergency room, “where they usually go when they are sick or need advice about their health,” other than an emergency room, as having a regular health care provider. We consider those who report having no usual place to obtain health care, or whose only usual place for health care is an emergency room, to be lacking a health care provider. 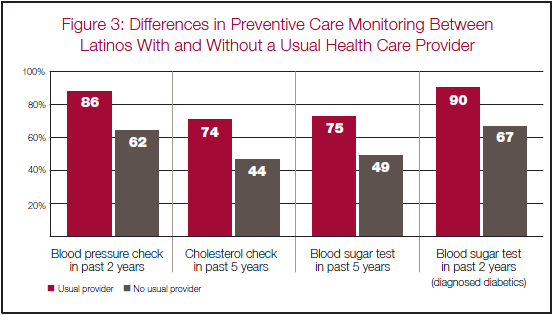 Defined this way, having a usual provider correlates with preventive care and monitoring. And preventive care and monitoring are both associated with better long-term health outcomes, including better control of chronic conditions. Among Hispanics with a regular health care provider, 86 percent report a blood pressure check in the past two years, while only 62 percent of those lacking a provider report this. While almost three-fourths of those with a usual place to get health care report having their cholesterol checked in the past five years, fewer than half (44 percent) of those with no usual place have done so. Latinos generally are at heightened risk of diabetes, and three-fourths of those with a regular health care provider report having had a blood test to check this in the past five years, compared with only 49 percent of those lacking a regular health care provider. Among already-diagnosed diabetics, it is especially noteworthy that, while 10 percent of those with a regular place for health care have not had a test to check their blood sugar in the past two years, this share jumps to 33 percent among those with no regular provider. Our survey results find that 73 percent of respondents have a usual health care provider and that 27 percent of respondents lack a provider. Nativity and assimilation are both linked to the likelihood of having a regular health care provider. 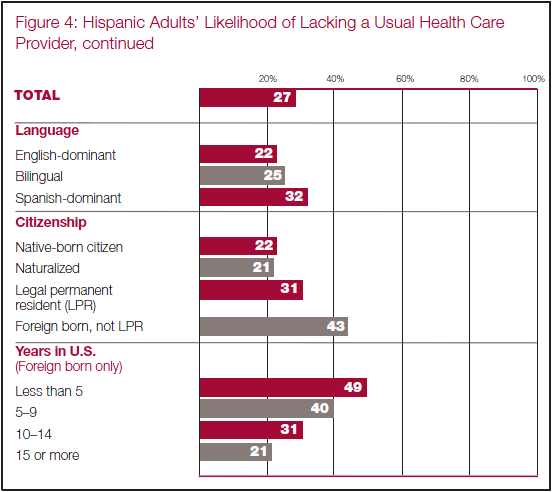 The lack of a regular health care provider varies markedly within the Latino population. For gender, age and education, the patterns mimic those in the general population.1 Latino men (36 percent) are more likely to lack a regular health care provider than women (17 percent). Younger Hispanics are especially likely to lack a regular health care provider: 37 percent of those ages 18–29 do not have one. This statistic declines with age; among respondents ages 65 and older, only 13 percent lack a regular health care provider. Higher levels of education are clearly associated with a higher likelihood of having a usual place to obtain health care. Only 19 percent of Hispanics with at least some college education lack usual health care access. That rises to 27 percent for high school graduates, and to nearly one-third (32 percent) for those with less than a high school diploma. Place of birth and assimilation also play a role in the likelihood of having a regular health care provider. While 22 percent of U.S.-born Latinos do not have a place where they usually go for medical care, this share increases to 30 percent among those born outside the 50 states. In general, less assimilated Hispanics are those most at risk of lacking a usual place for health care. Among naturalized and native-born Hispanic citizens, 21 to 22 percent lack a usual health care provider. That compares with 31 percent of legal permanent residents and 43 percent of immigrants who are neither citizens nor legal permanent residents. Among all Latino immigrants, about half of recent arrivals—those in the country for less than five years—lack a usual place for health care, compared with 21 percent of those who have lived in the United States for at least 15 years. Hispanics who are predominantly Spanish speakers are much more likely to lack regular health care than their predominantly English-speaking counterparts (32 percent versus 22 percent). Having health insurance is an important factor associated with having a usual place to obtain health care. While 42 percent of the uninsured lack a health care provider, only 19 percent of the insured do not have one. Getting Care Outside of the U.S.
About one in 12 Hispanics (8 percent) in the U.S. have obtained medical care, treatment or drugs in Latin America during the previous year, and one in six (17 percent) knows a family member or friend who has done so. Latinos who describe their recent medical care in the United States as only fair to poor are somewhat more likely to get medical services outside the country—11 percent have, compared with 6 percent of those who describe their care in this country as excellent. Hispanics without health insurance also are more likely to have received care in another country. Of those without insurance, 11 percent did; of those with insurance, 7 percent did. Of Latinos with a regular provider in the U.S. medical system, 8 percent say they have gotten care abroad, compared with 10 percent of those with no regular provider. Hispanics ages 65 and older are the least likely to seek care outside the United States (4 percent) and those ages 50–64 are the most likely (9 percent). Foreign-born Latinos are somewhat more likely (9 percent) than the native born (6 percent) to get medical care in Latin America, and those from Mexico (10 percent) are more likely than non-Mexicans overall. A higher share of bilingual (10 percent) and Spanish-dominant (9 percent) Hispanics seek medical care in Latin America than do English speakers (4 percent). One in 10 people with at least some college education report getting recent treatment or drugs in Latin America, compared with single-digit percentages for those with less education. Who are the Hispanics who are not being reached by the health care system? This section looks at the characteristics of people who lack a usual health care provider. Most Hispanics who lack a provider are male (69 percent). The population also tends to be young: 41 percent are 18–29 years of age, and 43 percent are 30–49. As is expected, Hispanics with low educational attainment comprise a large proportion of those lacking a provider; 47 percent report having less than a high school diploma. The vast majority of those with no usual place for health care are of Mexican origin (69 percent), and an additional 11 percent are of Central American origin. Of those Hispanics who have no usual place for health care, 45 percent have health insurance. Yet, what is also notable about those lacking a usual health care provider is the prevalence of Latinos whose characteristics suggest assimilation. While most Latinos who lack a provider are foreign born (70 percent), a full 30 percent were born in the 50 states. Half of those lacking a usual place for health care are citizens. A sizeable minority of immigrants who lack regular health care (45 percent) have lived in the United States for fewer than 10 years, but the majority (52 percent) have lived in the United States for 10 years or more. On a similar note, a slight majority of those with no usual health care provider is English-dominant or bilingual (52 percent). Finally, 45 percent of Hispanics who have no usual place for health care say they have health insurance. So though health insurance is correlated with usual care, it does not guarantee it. Why Don’t People Have a Usual Place for Health Care? 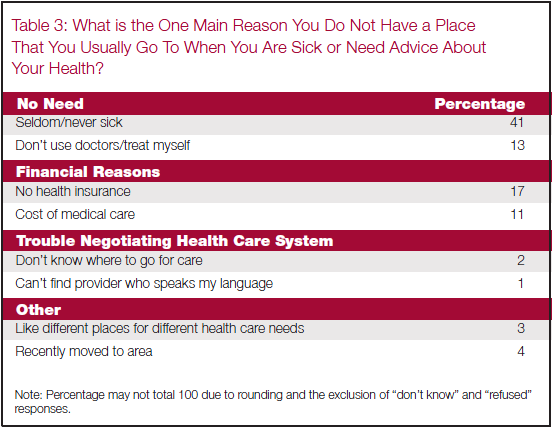 The survey asked respondents who lacked a usual place to get medical care or advice why they did not have one. * By far the most commonly cited reason was that they felt they did not need one because they are seldom sick (41 percent). An additional 13 percent report that they prefer to treat themselves than to seek help from medical doctors. The next most prevalent set of responses relates to finances: 17 percent report that they lack health insurance, and 11 percent report that the cost of health care prevents them from having a regular health care provider. About 3 percent of Hispanics respond that difficulties navigating the health care system are to blame for their lack of a regular provider: 2 percent report that they do not know where to get regular health care, and about 1 percent reports that they were unable to find a provider who spoke their language. Finally, 3 percent say they prefer to go to a number of different health care providers, not just to one place, and 4 percent say they have just moved to the area, so presumably have yet to establish a relationship with a provider. An overwhelming majority of Latinos believe that sick people should obtain treatment only from medical professionals, but a small minority say they seek health care from folk healers. Those who receive care from folk healers are slightly more likely to be U.S.-born than foreign born and to speak mainly English, not Spanish. Asked whether they obtain care from a curandero, shaman or someone else with special powers to heal the sick, 6 percent of Hispanics say they do and 10 percent report that someone in their household receives such care. About one in 12 Hispanics born in the 50 states use folk medicine, compared with one in 20 of those born in other countries or Puerto Rico. 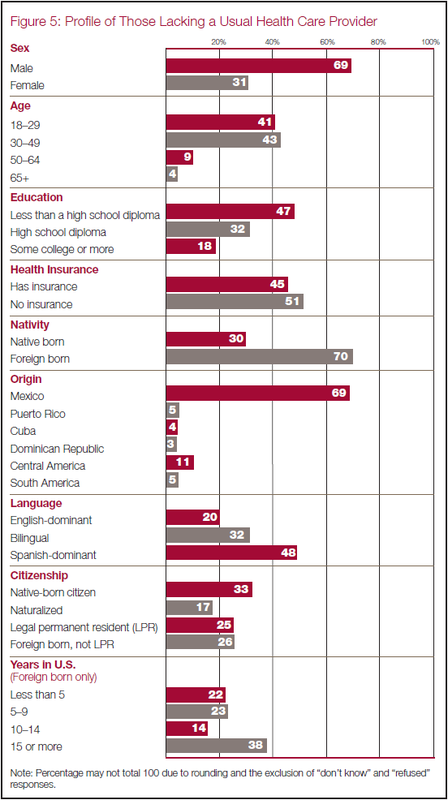 Similarly, one in 12 English-dominant Hispanics use folk medicine, as do one in 20 Spanish-dominant Latinos. 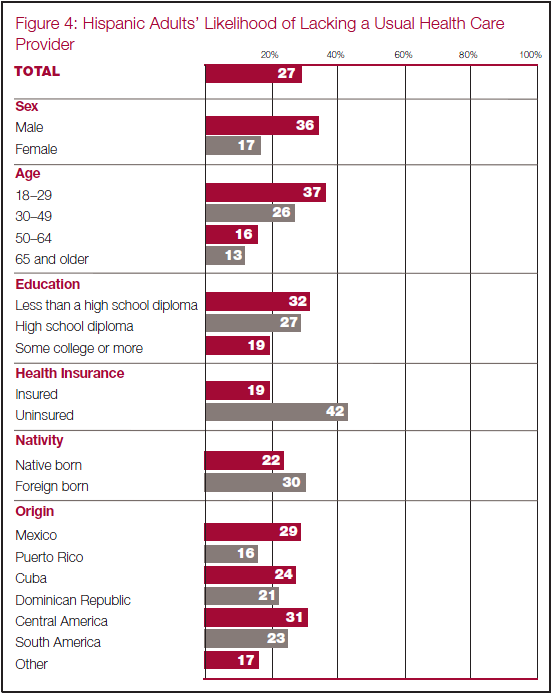 Hispanics of Cuban ancestry (11 percent) are more likely to obtain such care than other Latino groups. Hispanics without health insurance or a usual place for care are no more likely to seek folk care than those with health insurance or a usual place for care. Most Hispanics (87 percent) say that sick people should seek care only from medical professionals; only 8 percent say there is a role for folk medicine. Opinions about this echo usage patterns to some extent. Hispanics who speak English (14 percent), as well as those born in the United States (12 percent), are the most likely to say there is a role for potions and folk healing. So are younger Hispanics, as well as those with at least some college education. More than three-quarters of Hispanics who have had medical care within the past year rate it as good to excellent: 32 percent say it was excellent, and 46 percent say it was good. At the other extreme, 17 percent say their care was only fair, and 4 percent report poor care. In general, more educated Latinos, and those who have access to the medical system, give better evaluations of the quality of their medical care than do Latinos with lower education levels, no insurance or no regular source of care. 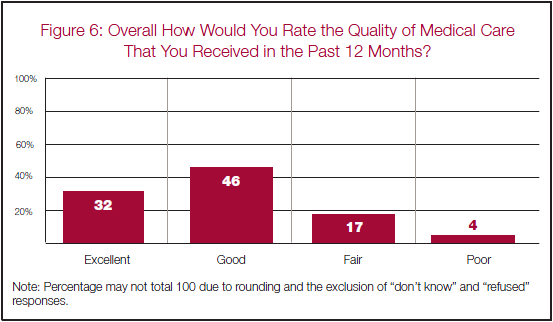 Women are more likely than men to say their recent medical care was good or excellent, 80 percent to 74 percent. Eighty-one percent of the college-educated report being satisfied with their care, as compared with 75 percent of people lacking a high school diploma. Having health insurance or a usual health care provider is associated with better perceived quality of care. Among Hispanics with health insurance, 80 percent rate their care as good to excellent; among the uninsured, 70 percent do. Similarly, 80 percent of Latinos who have a usual health care provider rate their care as good to excellent, compared with 64 percent who have no usual provider. Among those with a usual provider, Hispanics who usually get care in doctors’ offices give higher ratings than those who go to medical clinics. Fully four in 10 who go to a doctor’s office rate their care as excellent, compared with 27 percent of those who get care from a clinic. Generally, nativity and assimilation are not strongly associated with perceived quality of care. However, a mismatch between a Hispanic’s primary language and the language spoken at his or her appointment lowered the satisfaction ratings somewhat. For example, 30 percent of Spanish speakers whose appointments usually are conducted in English rate their care fair to poor, compared with 19 percent of those whose appointments are in Spanish. Respondents were also queried as to whether they had received poor service at the hands of a health care professional in the past five years. 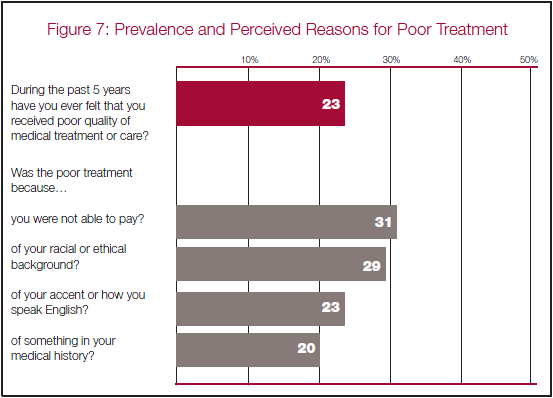 Those 23 percent who said they had received poor treatment were asked about four potential reasons. The largest share of Hispanics (31 percent) cited their inability to pay as the reason for poor treatment, followed by their race or ethnicity (29 percent), their accent or how they speak English (23 percent) and their medical history (20 percent). Respondents who lacked health insurance, or a usual health care provider, were especially likely to claim that their inability to pay, their race, or their language skills contributed to their poor treatment. Forty-one percent of Hispanics with no usual place for health care, and 53 percent of Hispanics with no health insurance, reported that their inability to pay contributed to poor treatment. In comparison, 27 percent of Latinos with a usual provider reported as much, as did 20 percent of Latinos with health insurance. Thirty-eight percent of Latinos with no usual provider and 34 percent of those with no health insurance reported that their race contributed to poor treatment by medical professionals, as compared to 25 percent of those with a usual provider and 26 percent of those with health insurance. Thirty-two percent of Latinos who lacked either health insurance or a usual provider reported that their accent or poor English skills led to poor treatment, while 20 percent of the insured and those with a usual provider reported as much. Other groups more likely than Hispanics overall to cite a lack of money as a reason for poor treatment include immigrants who aren’t citizens or legal permanent residents (45 percent), Spanish speakers (38 percent) and Latinos who did not graduate from high school (41 percent). Among the groups that are more likely than Hispanics overall to cite race as a reason they were treated poorly are Spanish speakers (36 percent), and noncitizens (38 percent of legal permanent residents and 35 percent of immigrants who are not citizens or legal permanent residents). Among the groups most likely to cite language as the reason they received poor care are Hispanics with less than a high school education (37 percent), immigrants (33 percent) and those who mainly speak Spanish (43 percent). Medical history is given as a reason for poor care by a somewhat higher share of older Hispanics (25 percent) and those whose primary language is Spanish (25 percent). II. Hispanics and Chronic Disease in the U.S.